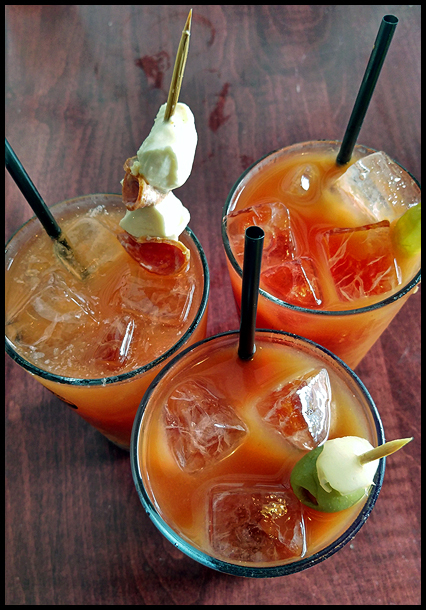 The 2nd Buffalo Bloody Mary Fest! 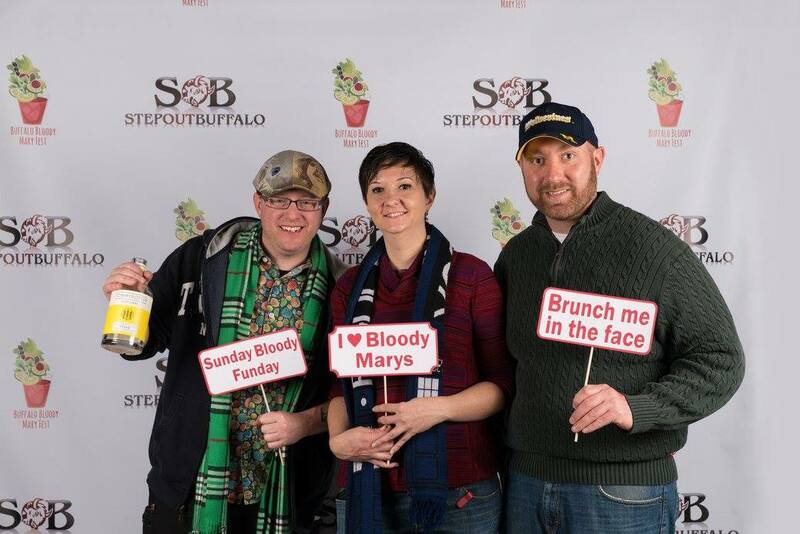 After a successful first outing, Step Out Buffalo brought back the Buffalo Bloody Mary Fest for a 2nd year, this time moving from Shea’s Theater to Buffalo Riverworks. 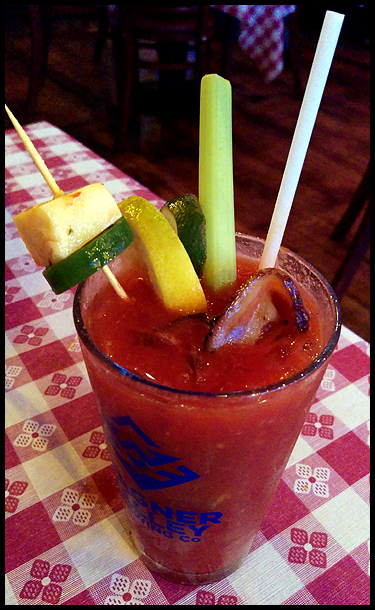 The concept was the same, 10 Buffalo bars prepare their best Bloody Mary for a thirsty crowd. It was a nice day out, but it is still winter in Buffalo, and having to park in an overflow lot down the street, that meant coats. So suggestion #1 to Step Out Buffalo for any future winter events of any kind is: COAT CHECK! It forced everyone to make their way through an already crowded space in bulky coats and jackets, and it got hot and uncomfortable after a very short time inside. But on to the drinks! 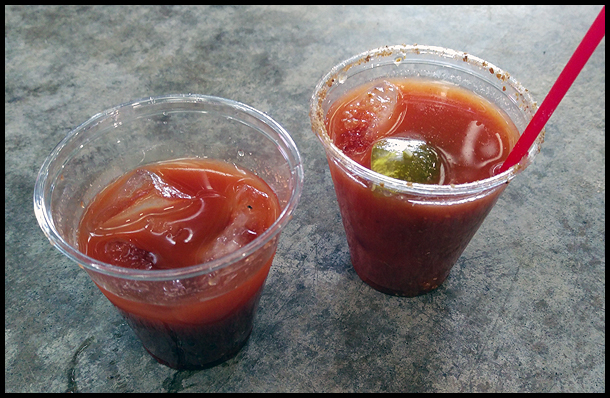 The samples were smaller this year, but that wasn’t necessarily a bad thing, as by the end of the event last time, I got a bit tired of bloodies (sacrilege!) 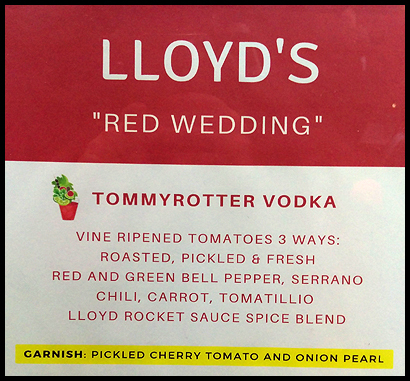 Tommyrotter Distillery provided the vodka again this year, and 10 different bars were in attendance, which was nice to see. My reviews will be pretty short again. 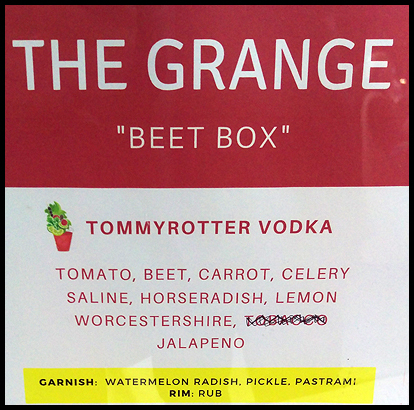 Ingredients – Tomato, beet, carrot, celery, saline, horseradish, lemon, Worcestershire, tobacco, jalapeno. I wonder how long it took them to notice there was “tobacco” in the drink! haha! 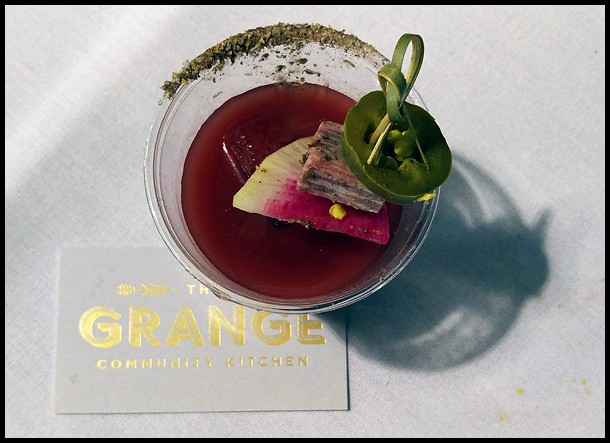 With a spice rim, and a garnish of pickled jalapeno, meat chunk (actually pastrami), and sliced beet (actually watermelon radish), the drink had a distinct beet-y taste with a hint of smoke from the meat chunk. It was a tad salty, but a decent offering. 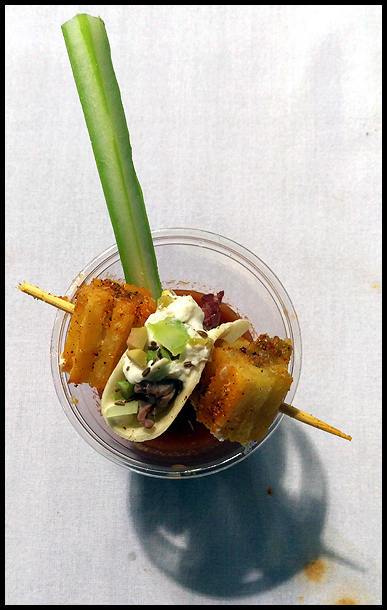 Deep South Taco had the best garnish of the day, with their savory churro bites, sprinkled with chili powder, and a beef on weck mini taco. 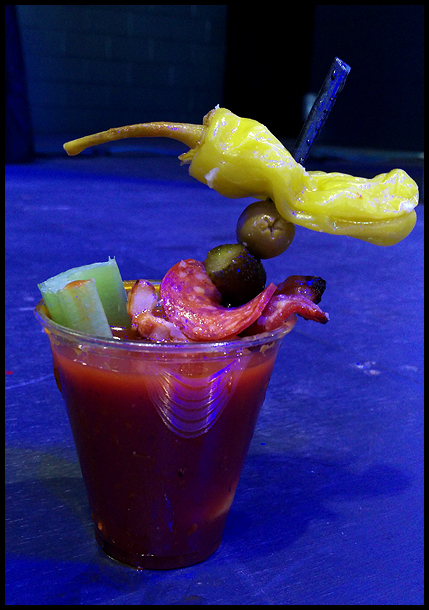 I was glad to see most of the bars stepped up their garnish game this year. The drink was heavy on the horseradish flavor, and was quite good. It was very different (and better) than their bloody I had at the restaurant. Wikipedia: A beef on weck (also known as beef on wick) is a sandwich found primarily in Western New York. It is made with roast beef on a kummelweck roll. The meat on the sandwich is traditionally served rare, thin cut, with the top bun getting a dip au jus and spread with horseradish. 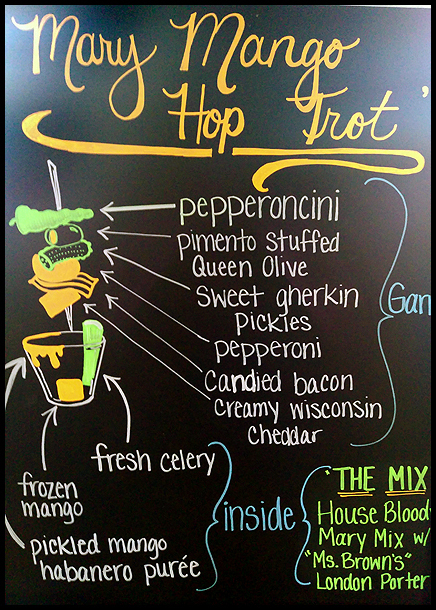 Garnish – pepperoncini, pimento stuffed Queen olive, sweet gherkin pickle, pepperoni, candied bacon, Wisconsin cheddar. I grabbed the drink, and my hands were immediately sticky, apparently from the mango habanero puree, but I didn’t taste it since I didn’t quite know what it was, and I try not to lick random sticky things. I’m not a huge mango fan, so it was good that there wasn’t overwhelming mango taste to this sample, but it did make it quite sweet. Not bad, but not my style for a Bloody. 2nd best garnish of the day. With the cilantro garnish, I admit I was scared, as I am one of those genetic freaks who hate cilantro because it tastes like soap. I was pleasantly surprised that there was no cilantro taste in the drink, but a strong onion flavor instead. It was reminiscent of salsa, with good spice, and it tasted super fresh. It may have been my favorite of the day. Jeff hated it. Sear had someone live blow-torching their chorizo sausage garnish – badass! The drink wasn’t equally badass though. It had a decent smoky taste, but it was fairly thick from using mass produced tomato juice, and the addition of what I thought was pesto, but apparently was salsa verde, gave it a flavor that was too much like pasta sauce. It was a tad oily from the garnish, so I didn’t want to finish it all. The chorizo was good though! Another bloody with mango, this drink was, again, a sweet take on a typically savory drink. Watching them put the drink together, I thought there was cranberry jelly and shredded carrots in it, but apparently it was mango shrub, and pickled beets? I swear it was carrot. It had a good tomato flavor, but it wasn’t for me. No photo because it was very hard to move around upstairs at this point, and the drink wasn’t particularly visually interesting. 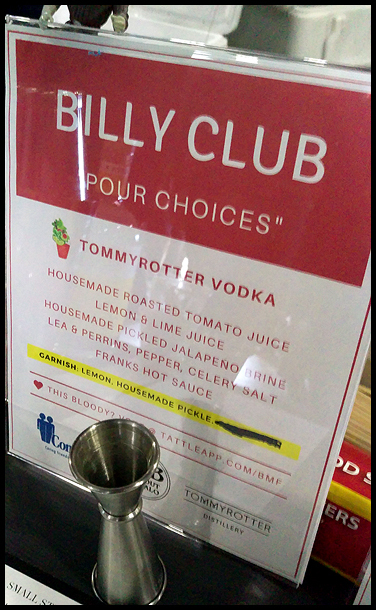 We recently had dinner at Billy Club, and it’s one of the restaurants that I’d call….hipster pretentious. Not to say it wasn’t good, but it is a restaurant that serves lots of small plates, and in the spring will surely offer ramps – WHICH ARE NOT A MEAL – and it really bugs me. Ahem, I’m sorry, long story*. Ok I’m back now. Billy Club ran out of garnishes by the time we got upstairs to give them a try, but by the sound of it, we didn’t miss that much. The drink was very pepper-y and vinegar-y. It wasn’t bad, but it was nothing special. The What the Weck bloody had a fennel and salt rim, the ingredients in “weck”, which was a great addition to this drink. It had a super strong horseradish flavor, but it had a weird after taste, maybe the beef consumet? It had too much debris though, it would have been better with a bit less. Pasion is probably my favorite restaurant in Buffalo right now. It’s a Latin American restaurant, and when we go there, we order so many small plates, we never end up wanting our entree. By the time we were ready to try their bloody, they had a crazy crowd. I doubled up on the above 2, while Jeff waited to get his and J’s sample from Pasion. They had gotten theirs by the time I joined the crowd, and they both said it was worth the wait – they thought it was the best. I was excited! The mini cubano slider was delicious. But with all that build up, the drink ended up being a let down for me. I couldn’t tell why, but seeing the ingredients list, it was probably the evil cucumber. It was a bit fruity, with some spice and a spice rim. It grew on me, the more I drank, but I was sad to conclude that it wasn’t my favorite. Do you really think they had tobacco onions? Sophia’s was another one that had a big crowd, so we skipped it to try upstairs, and came back to it at the end. By the time we did so, they were out of bacon. Booo! 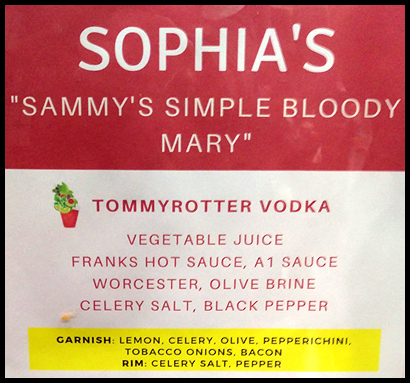 With a spiced rim, and pretty standard garnishes, Sophia’s was the most classic drink at the Fest. Had we known, we should have started with this, and judged all the variations after, especially J since he was palate training. It was very tomato-y and had a very strong celery flavor. If you got tired of drinking (ha!) this year’s fest featured some fun distractions. 2 local craft party companies were set up – Studio Hue and Buffalo Collective – offering quick crafts for $5: DIY flasks and custom pint glasses respectively. If crafting wasn’t your thing, SPACE brought several pinball machines, all with free plays, and Fabubus mobile spa was set up outside. There were snack tables set up with cheese and fruit, food available for purchase from Riverworks, and a couple vendors including ADK Blood Mary Tonic, which we picked up to review at a later date. There was no panel of judges this year – so I didn’t get to be one. Instead they opted for public voting on the Tattle app. Unfortunately, none of us could get it to acknowledge that we were, indeed, at the Fest, so we were unable to vote. 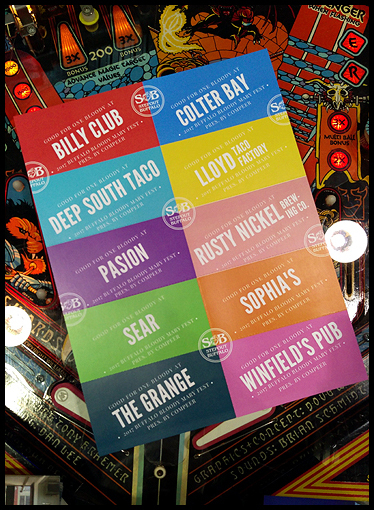 My votes would have been Lloyd for best, Deep South Taco for best garnish and Rusty Nickel Brewing for most unique. The actual winners were Sophia’s for best, and Deep South Taco for best garnish and most unique. With the fest held in a larger location, that also allowed for a larger crowd. We intended to go a little later, in hopes to avoid having to wait in long lines for our samples, as last year it thinned out a bit after the first hour. Unfortunately, that was not the case, and we were often stuck in immovable crowds, unable to get a sample, and unable to get to a different restaurant. Riverworks is oddly shaped, so while they tried to put the restaurants back to back to provide crowd movement, it didn’t quite work out. I don’t have a suggestion to make it better, though, either. We skipped Sophia’s our first time around the main floor and headed up stairs because by the looks of the balcony railing, it looked to be empty. Wrong. Upstairs it was worse, as it was an even smaller space, with the same number of restaurants set up – plus the photo “booth” and 2 craft areas (and VIP. Yes, there was a VIP area, but we did not choose that route this time. I’m not sure it would be beneficial, as you still have to wait in long lines to get your samples, and then get back upstairs to a more open area to sample in peace). The crowd didn’t thin out until about 3:30, and by then many of the restaurants had run out of garnishes, and you wouldn’t be getting their best. All that said, we still had a great time, and enjoyed all the different offerings. By the end, we were a little bloody mary-ed out, so we finished the afternoon with mimosas! I have more photos from the fest to share, but I’ve been writing this for 2 hours, and I need to get ready for pub trivia! *When we were in NYC for Hedwig and the Angry Inch and got stuck an extra night due to our flight being canceled our group had dinner at a restaurant in Brooklyn. There were 7 of us I believe, and we ordered the entire menu – mainly small plates, one of them being ramps. I didn’t know what ramps were at the time, but I quickly found out, they are not food. A plate with 5 pieces of, essentially, grass, is not a meal! It’s a garnish! It’s what you add to real food to season it! It makes me so angry! The other small plates were at least real food, but no where near enough to feed 7 people satisfactorily. Comments Off on The 2nd Buffalo Bloody Mary Fest! The Superbowl has come (and gone) and being from Buffalo, by default I have to hate the Patriots. So booo on that admittedly incredible comeback. In reality, I am not a football fan (Go Sabres! 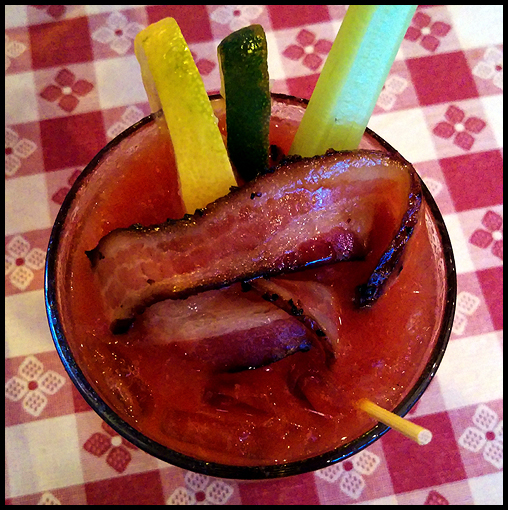 ), but I am a brunch and bloody mary fan, and Fat Bob’s Smokehouse was having a Super Sunday Brunch with a “build your own bloody” special. Sign me up! I have had Fat Bob’s standard bloody before, and having re-read my review to refresh my memory, it wasn’t fantastic. It was a good start, with a tasty house made mix, but lacked anything to make it special. Enter their BYOB menu. So many choices! Where does one even begin? At the top I suppose. Priced at $6.50 to start, my assumption is that if you didn’t choose a vodka (or other liquor) for an additional dollar, you would get well vodka and not a Virgin Mary. I was overwhelmed with all the choices for additional flavors, and extras to add. With so many choices, J decided to create one for me as well. 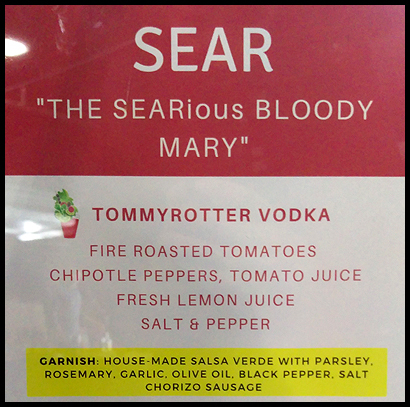 Once again, their mix had a good tomato flavor, and adding in their hot sauce and horseradish turned what was formerly a bit of a let down into a great, SPICY, tasty drink. Usually I’m a fan of my bacon being super crispy, nearly burned, but when it’s house made and thick, I’ll accept limp bacon. It was delicious (I had some more from the buffet too). Sadly, unless I somehow missed it at the bottom of the glass, my pickle and pepperoni were forgotten, but I got the standard celery (which was listed as an add-on) lemon, and lime garnishes. It’s really neat how the “same” drink can turn out so very different. This cocktail had a sweet taste to it, along with more citrus notes. It was spicy, but it was hard to tell if it was spicier than my creation, as my tongue was already burning. I didn’t feel like it was overwhelmingly Cajun, but perhaps the flavor got overpowered by the hot sauce and other additions. 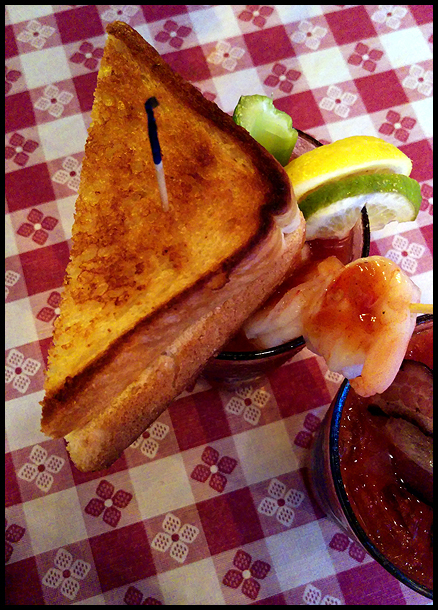 Topped with half a grilled cheese sandwich and 4 shrimp, it also had the standard lemon, lime and celery garnish. 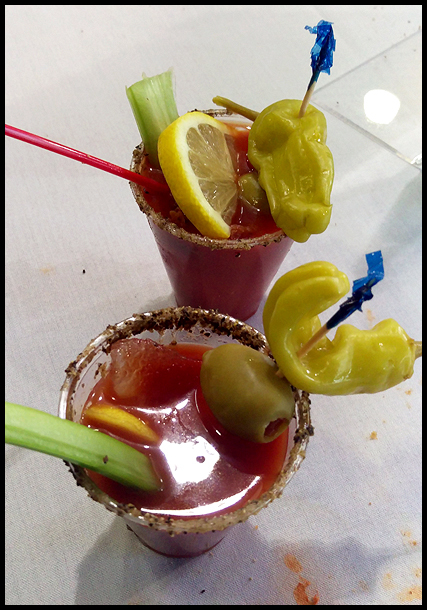 For anyone who was overwhelmed by the BYOB choices, they still offered “classic” bloody marys with a variety of liquors to choose from. 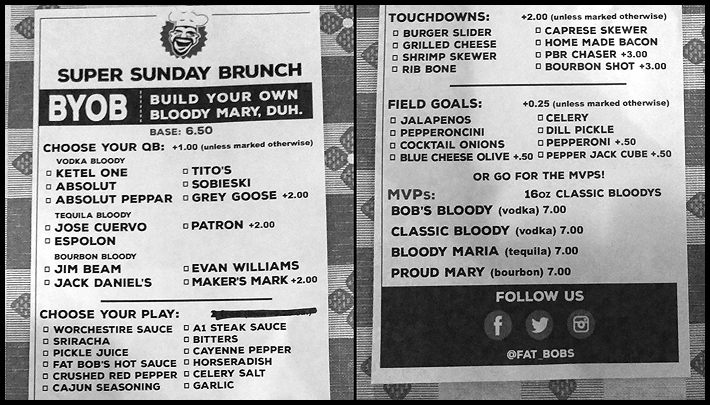 I honestly don’t know if Fat Bob’s offers brunch normally, but if they don’t, they should keep this BYOB menu available. I imagine it can get annoying for the bar tenders, but they have a good base mix to start from, and with all the choices on the list, a guest can create the perfect drink for them. 2 shots of my drinks from the Fat Bob’s Instagram, taken by Cory Watson. I was the first to get a grilled cheese. It seems like Buffalo is having another new restaurant open every week. We go out for dinner twice a week and we still can’t keep up. We have a list of places we have yet to visit, and new ones keep getting added! Burning Buffalo is a new restaurant and bar on Hertel Ave, and we tried to go a few weeks ago but they were closed. Turns out we tried to go the day before their official opening. Oops. But we made it there eventually. 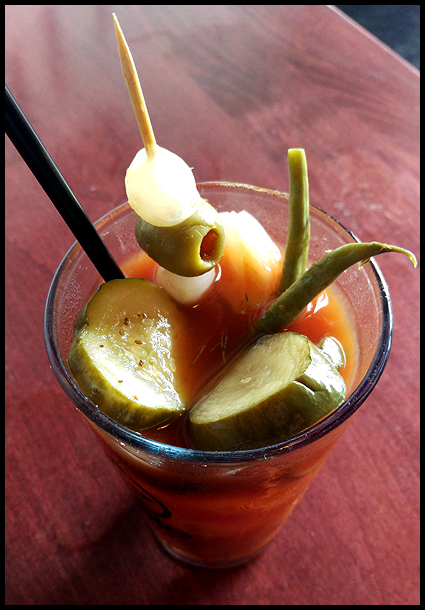 I was starting to get a little sad, because honestly, I haven’t had a local bloody mary that blew me away in a while. They’ve been mostly alright, but nothing GREAT! When I saw it on the menu I was hesitant to order it, only because I wanted something yummy to drink, and I was scared of being disappointed again. But I gave them a chance anyway. Enter the terrible dark bar photography. The Burning Buffalo Bloody Mary. Served in a pint glass for $8, and garnished with lemon, olive and a full celery stick, this cocktail is labeled “Local” for featuring Niagara Distilling’s 1812 Vodka and a house made mix. Advertised as smoky and spicy, I was a little nervous since the last bloody I had that was labeled “smoky”, in St Louis, was really too much. Fortunately, this bloody was a fantastic mix of smoke and spice. It didn’t taste like they stirred it with a lump of burned wood straight out of the campfire. The spice wasn’t overwhelming, but it was definitely present, as well as a lot of visible pepper. And if you needed more, there was definitely some pickle flavor as well. I was impressed at first taste, and I had J take a sip as well. 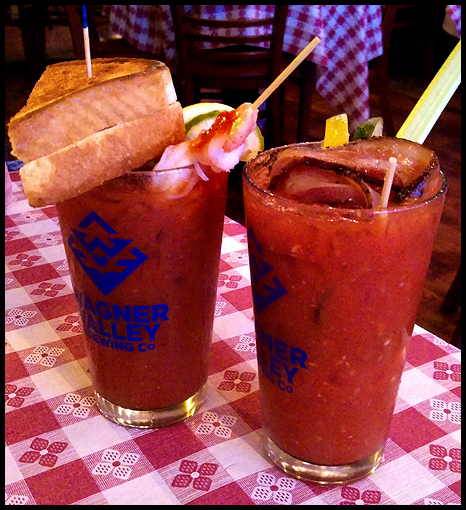 He is still scared of bloody marys, but even he said it was pretty good. I’ll learn him one day! Burning Buffalo’s bloody is one of the best I’ve had locally in a while. Definitely try it. I also had their turkey club sandwich, which included a stuffed banana pepper, and it was fantastic. Another cold and snowy night in Buffalo. While the southtowns were getting pounded with lake effect snow, downtown was only getting a dusting, and it was dinner time. The theater district, and Main St, has been having a bit of a rebirth now that the city has reopened the street to cars, leading to several new restaurants opening in the area. We decided to try Hearth + Press, the newest stone hearth pizza restaurant. Hearth + Press is a bit of a weird combo. Given it’s location in the business area of the city, it markets itself as a coffee shop and lunch spot, hence the “Press” part of the name (press referring to French press, and not panini press, as I assumed). The menu offers a variety of sandwiches, salads, pastries and coffee along with their Neapolitan pizzas. What to say? You know, I don’t like giving bad reviews. I usually conveniently forget to review the drinks that have been downright bad, because what’s the point? But sometimes you just have to do it (like Templeton Landing). This drink is a paradox. All at once, this drink was watery and chunky. That first sip contained a very liquidy drink full of chunks…actual chunks…of tomato. This was not the Ragu-like chewiness of one of my St Louis bloodies, which was entirely thick, or the Burning Asphalt mix which was like ketchup. It was like opening a can of diced tomatoes in juice. Even though the drink was freshly made, I thought maybe there was just a lot of debris that settled to the bottom of the glass, so I stirred it up. You could bring up entire chunks of tomato on the straw. The 2nd sip was more of the same, chunks of tomato that have to be chewed. I may be weird, I don’t like hard things in soft food, like fruit on the bottom yogurt, but it was just not right. 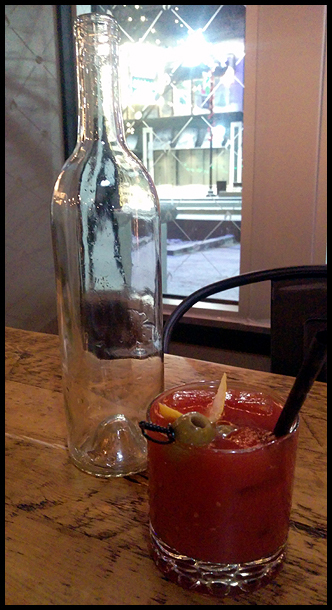 Which is a shame, because San Marzano tomatoes are delicious, and the drink itself did not taste bad. I just can’t. I tried to finish it, but I couldn’t (and that’s rare). There was no hint of spice at all (I did not request a spicy drink, because I just assume there is some spice), and other than possibly pepper, there was no other flavors beyond tomato. As it stands, I would never order this drink again. My advice: keep making a fresh mix, but strain, strain, strain! As a whole, we didn’t have a great experience. It was uncomfortably cold inside, despite an open hearth oven, and (as we discovered) a portable heater behind J. Our pizzas were fine, featuring a sweeter dough which I enjoyed, but we were not blown away, and I would try something other than the pomodoro and pesto pizza that I ordered if we return. Basically we had to eat as fast as possible, so we could get out of the cold, and back outside into the cold which didn’t feel much different. 2 years ago one of my friends and co-workers invited me to be a part of our company’s trivia team for Cradle Beach’s “Buffalo’s Smartest Company” fundraiser each spring. Our company won a few years ago, but as they like to pick on me, we haven’t won since I joined the team. 🙁 I like trivia, and showing off weird knowledge, even if I do feel pretty stupid now that I’ve finished my first season playing Learned League (I came in 18th of 24, and had several competition days where I scored zero, boo!) So of course, bar trivia is a good mix of smarts and spirits, and we will attend different styles at different places around Buffalo, the most recent one occurring at the New York Beer Project in Lockport, NY. J and I headed over there a bit early, as we had nothing else to do, and good thing we did! We were told it started at 9 but when we got there at 8:30, it had already started. We joined in late as The Dirigible Plums, as we waited for our other friends to show up, and the quiz master gave us a free 10 points to make up for missing most of the first round. We’ve visited NYBP before and tried all their beers, but J got a flight again, and I decided on trying their Bloody Mary. 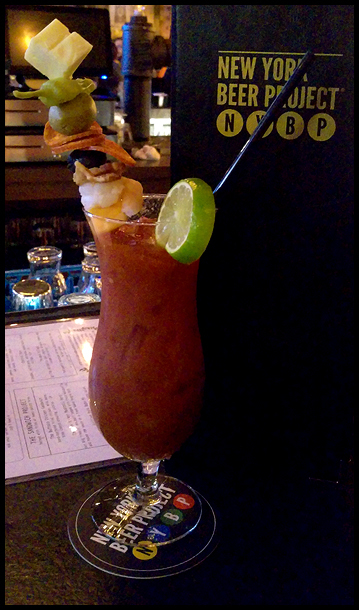 Served in a hurricane glass for $10, the NYBP had some garnish game going on – cheese cubes, pepperoni, pepper, bacon, shrimp, and olives on a skewer. The drink had a good amount of spice, good tomato flavor, with a hint of pickle. It was a decent offering from a brewery, and I’d have one again if I wasn’t in the mood for beer. We ended up winning trivia night, by a lot. Guess we didn’t need those free 10 points! Happy New Year!! And happy anniversary to Bloody Queen City! I bought the domain a year ago today, so it’s time for a new review. I have yet to have one in 2017, so we’re going to have to settle for one of the drinks I have in the archive. 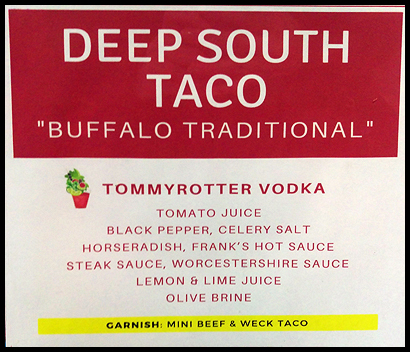 Deep South Taco‘s Mexican Bloody. Deep South Taco is a fairly new Mexican restaurant in Buffalo, a little more than a year old I believe. They just opened their 2nd location on Hertel Ave, the first being on Ellicott St downtown. We’ve gone there quite a bit, as they have a nice big patio in the summer, and of course, delicious food and drinks. 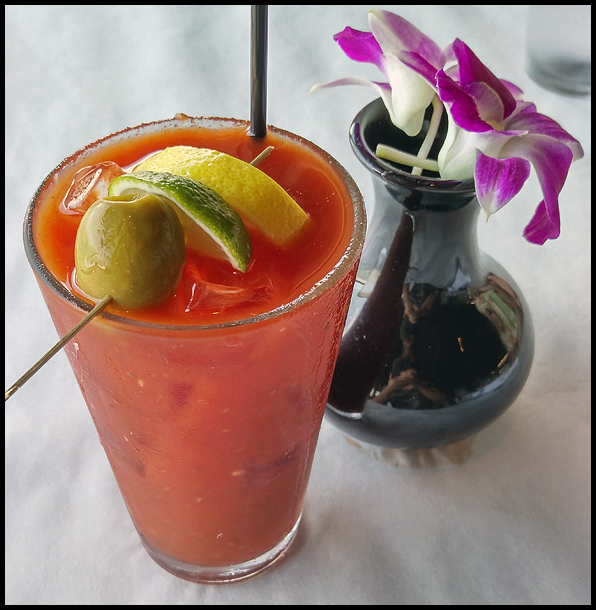 It took me a long time to finally try one of their 4 Bloody Mary offerings, as I always get margaritas with Mexican food, and we haven’t yet been there for brunch. Another terrible, terrible photo, but there was just no way to capture this one. Comments Off on Happy New Year!! I’ve been slacking. While we were at dinner a few weeks ago, J pointed out that I hadn’t blogged any drinks in a while. 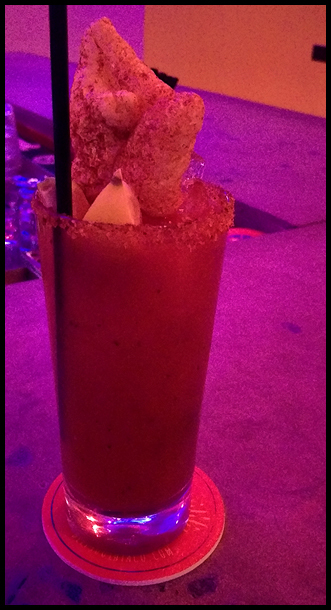 So that night I had a bloody mary but I got lazy posting about it. Now I’m 3 drinks behind, but that ends today! I’m going to start with the most recent one though, 810 Meadworks, and work backwards. 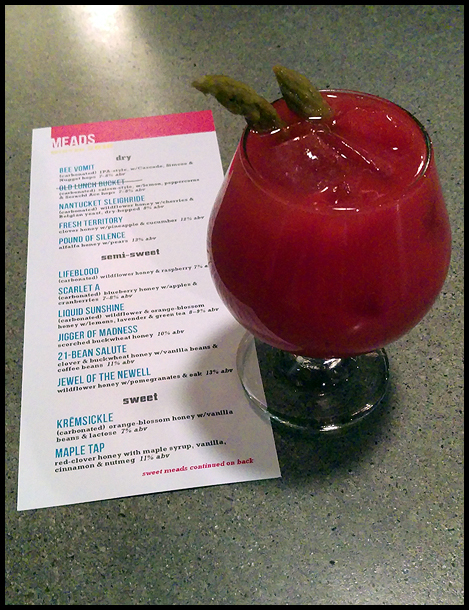 J had found a blog entry about local cocktails, and it featured 810 Meadworks as having WNY’s best bloody mary, which meant I had to try it. Somewhat unfortunately, we live about an hour away from 810, which is located in Medina, NY so it was a bit of a drive, but there is also a fantastic Mexican restaurant in Medina, so we made a night of it. If you are not familiar with mead, it is an alcohol made from fermented honey, and it may have been history’s first fermented liquid! Since it’s made with honey, mead typically tends to be sweet, with even “dry” meads being sweeter than what you’d expect if you are used to dry wines. 810 Meadworks opened in 2014, with 8 different meads on tap. That number has grown to over 20, and we tried them all! Flights cost $5, for 3 – 2oz mead samples, which you can pair with some very creative handcrafted chocolates, or other small plates (there is no kitchen in the tasting bar so you’re looking at cheese and crackers, breads and spreads, to go along with your mead.) After your flight(s), if you’re still looking for more, they sell mead by the glass, and mead cocktails – which is where the bloody mary comes into play. Presenting The Ghost of Mary! 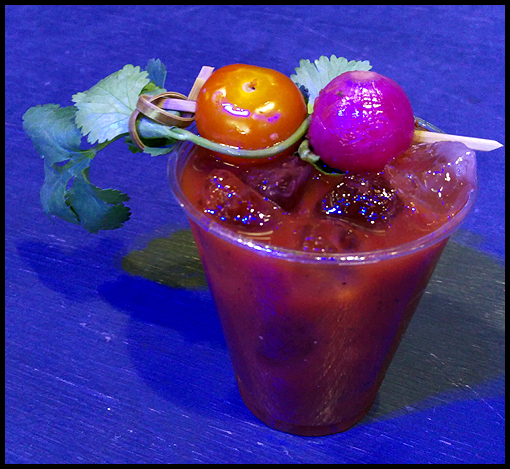 For $4, owner and brewmaster Bryan DeGraw, put together this little drink with his Royal Squeeze mead infused with ghost peppers, V8 bloody mary mix, and 2 spears of pickled asparagus for garnish. He asked if I wanted it very spicy, or just regular spicy, so of course I said “Very!”, which meant 2 oz of the ghost pepper mead. (Regular spicy would be made with just 1 oz, and mild would be made with a serrano and thai pepper infused mead instead.) 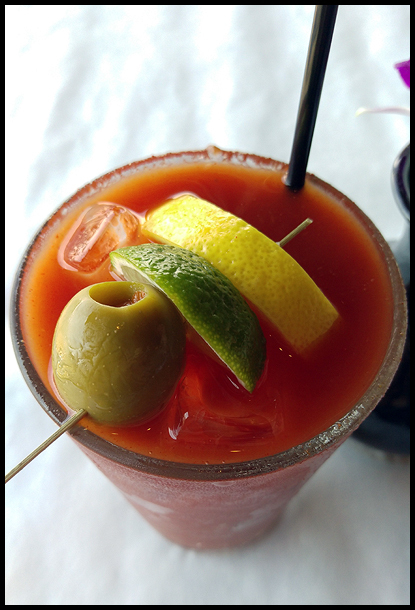 The drink was different than your usual bloody mary, as the mead gives it a sweetness that vodka or other liquors do not. And the ghost peppers definitely made it spicy, probably too spicy for some people, but not for me! It was a simple drink, with a big taste, and I definitely recommend giving it a try if you are in the area. 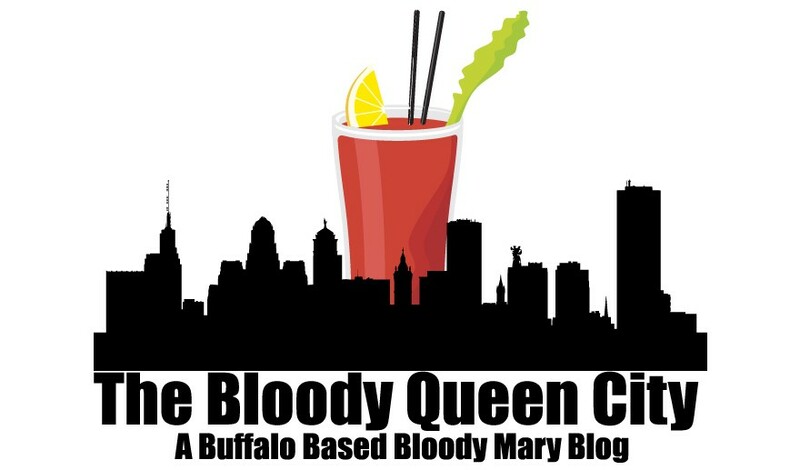 In related news, The Buffalo Bloody Mary Fest is returning in 2017, this time being held at Riverworks, which allows for a larger crowd. Tickets for the fest sold out in less than 4 days, again! Glad I got mine on the first day. Can’t wait! Sunday morning, we woke up fairly early (for night shift workers) after attending an Oktoberfest the afternoon before and going to bed early. Up early means brunch! It was a cool fall day, but nice enough to take a walk and get some food. I suggested we try Lloyd’s Taco Factory. We had their brunch before, when they were just serving out of their truck in partnership with Buffalo Proper, but now with a brick and mortar location they’ve started offering their own brunch. We made it to the restaurant only to find it closed! Now what? Time to cross the street and check out what CRāVing had to offer. 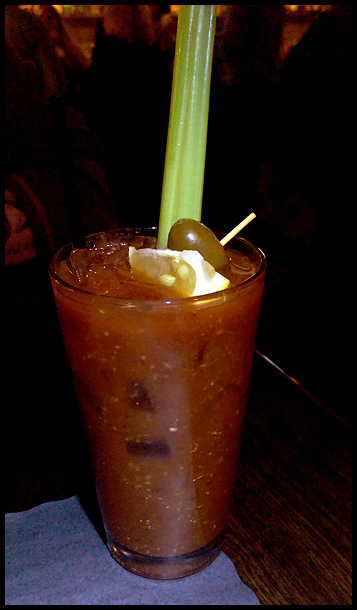 On their brunch cocktail menu, CRāVing was featuring a Traditional bloody mary for $8.50, but also offered Adam’s Bloody – Tomato, fennel, beets, horseradish root, celery, sriracha, worcestershire, lemon, lime and vodka for $10.50. Garnished with an olive and lemon slice, it didn’t look particularly fancy (especially after last weekend‘s bloody!) 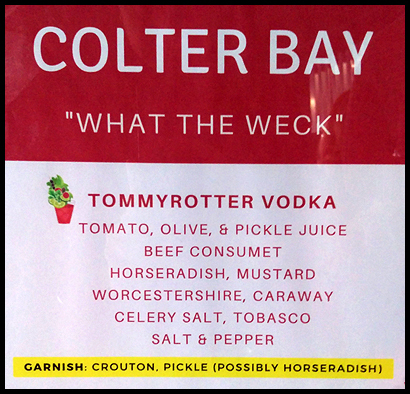 It was very watery, with a touch of horseradish tang. It had a good spice level, but none of the flavors were particularly strong. It didn’t have a strong tomato taste, and I couldn’t detect any fennel or celery flavor. It wasn’t mind blowing, but it was drinkable, and for whatever reason, it felt healthy! 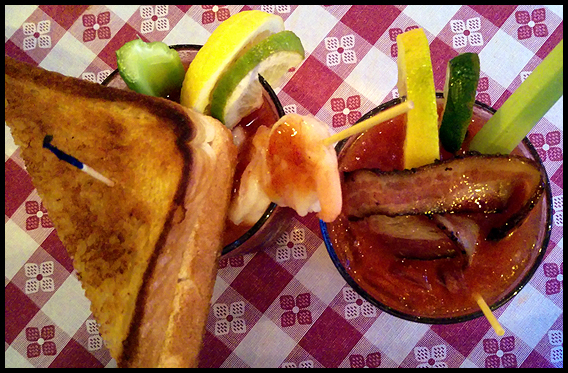 I don’t feel that I have that much going on in life, but somehow I found myself too busy to be able to write up this bloody mary review from last week at William K’s in the Erie Basin Marina. Perhaps it’s the need to pick and do something with the bushels and bushels of peppers and tomatoes I’ve got growing in the garden. I’m drowning! 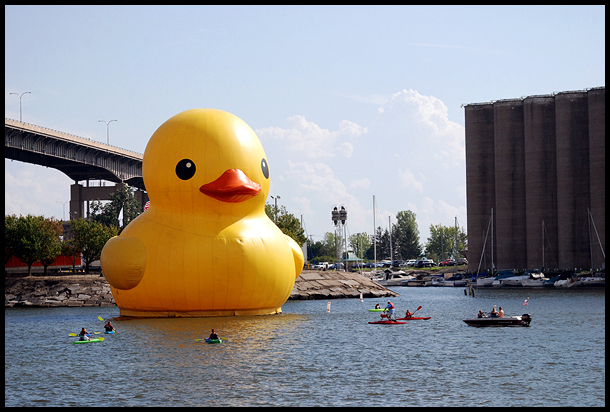 Last weekend was the Buffalo Maritime Festival at Canalside and the adjacent Naval Park, which was visited by the World’s Largest Rubber Duck! While it created a perfect storm of traffic in the area, I thought it was a good time to multi task and see the duck, and get some brunch and a bloody (and J could play pokemon). The World’s Largest Rubber Duck in Buffalo NY! William K’s seems to be a recent addition to the Buffalo restaurant scene, and I had seen a posting from a brunch there on instagram a few months ago. Located in the Erie Basin Marina, it’s a bit farther down the point than we usually go, so we didn’t exactly know where it was when we first heard of it. 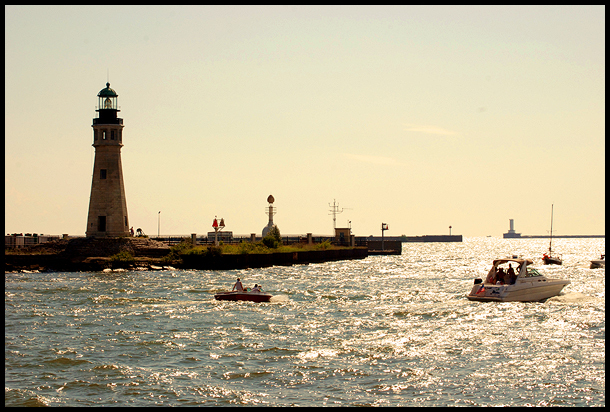 The restaurant is right on the water, past Templeton Landing, at the point where the river meets the lake, with a perfect view of the newly re-lit light house. 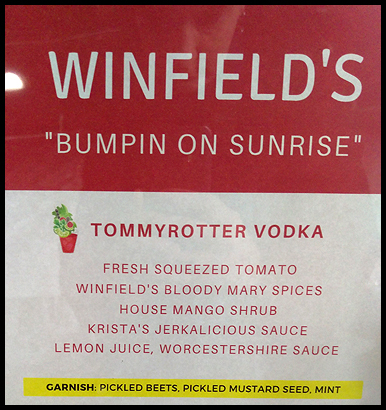 William K’s offered a house bloody and a spicy bloody, which was my choice. Served in a pint glass for $8, it definitely had a good deal of spice. You could detect the addition of Frank’s hot sauce, but I don’t believe it was the only thing contributing to the spiciness. It was fairly thick, with visible pepper in the mix. Garnished with a lemon, lime and olive it was a very drinkable offering, though not particularly unique. J ordered his standard choice, of eggs, bacon and potato, while I went on a limb and tried the blueberry french toast (with ice cream on top!). If you were going for brunch at the harbor, looking at William K’s versus Templeton Landing, I’d definitely go with William K’s. Your standard olive, lime and lemon garnish. We’re going on vacation soon, spending a few days in Boston and a few in the Adirondacks. Hopefully I can find some good drinks to try! As I mentioned at the end of my last post, Lockhouse Distillery was having a mix release party, and while I thought it was for a mix that they were creating, it turns out it was a party for Barrel and Brine‘s mix. If you recall, they were the ones making the mix for the Black Sheep which I reviewed a few months ago, but now they are bottling it for public sale. 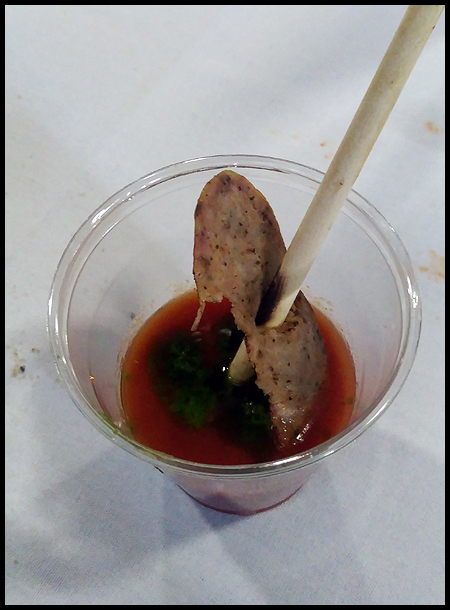 So while I was a little bit less excited, since I’ve had the mix before, I was still excited that there was any kind of Bloody Mary party to go to. 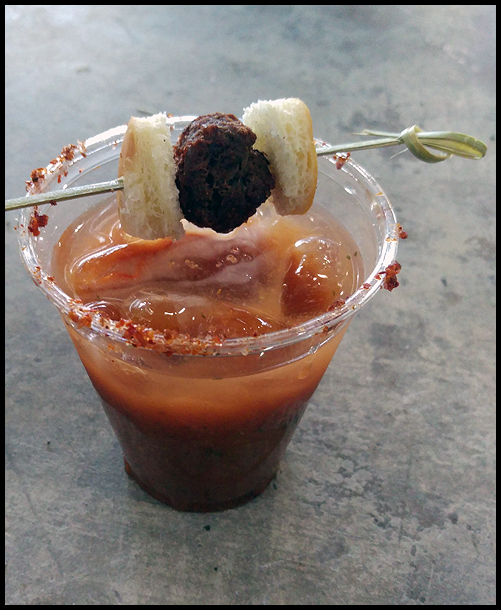 Lockhouse was offering 3 different Bloody Mary concoctions: The Pizza Lovers, the Barreled Bloody, and Mary’s Garden. I thought I was being smart by ordering all 3 at once, so I could taste test them all together, but I was wrong. Not only because they warmed up and the ice melted, but because I’m pretty sure my drinks were made by the bar back, and they were all made incorrectly. *sigh* Just my luck. So let’s start with the Pizza Lovers. It was supposed to have mozzarella, pepperoni and basil, and feature Lockhouse vodka. As you can see in the photo (the drink on the left) it did have a skewer with cheese and pepperoni, but it lacks the basil that was stuck in everyone else’s drink. Ok, no big deal. This bloody was made with a different mix than the other two, which I’m assuming was still made by Barrel and Brine, but I’m not sure. It was poured out of an unlabeled wine bottle, and was a completely different texture and flavor. Honestly, it didn’t really taste like much, and of the 3, it was the least exciting. There was a lot of debris floating in it, even though it was still quite liquidy, with mild spice and pickle flavor. Beyond that, it didn’t taste like much. Next, the Barreled Bloody. The drink was supposed to be made with barrel aged gin, molasses bacon rim, pepperocini, celery and chives, but as you can see in the photo (the top drink), all I got was a pepperocini, and I suspect it was made with vodka. 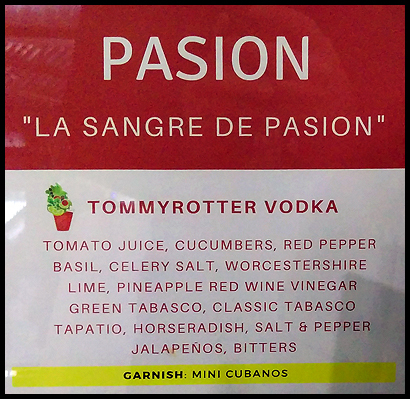 Assuming that it was indeed made with vodka, this was pretty much your basic normal bloody, with the Barrel and Brine mix, poured out of one of the jars they were selling. 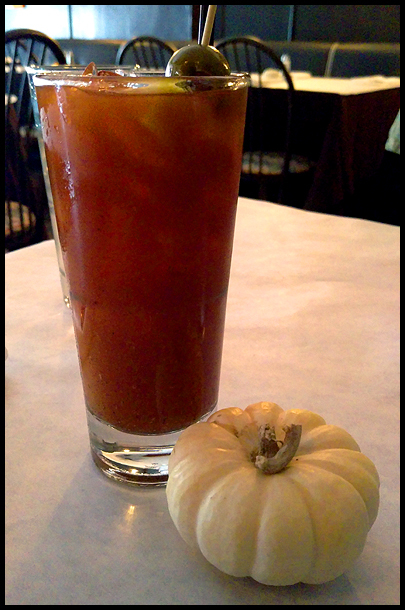 Surprisingly, it had a very different flavor from the Bloody using their mix at Black Sheep (which is a good thing!). It was definitely not as overwhelmingly pickle flavored and salty, with a mild spice level, that was very good. It had a good strong tomato flavor, and was definitely drinkable. The lack of a bacon rim = highly disappointing. Lastly, Mary’s Garden, which was being offered with Lockhouse vodka or gin, though he didn’t ask me what I wanted. I suspect it was gin, as it had a completely different flavor than the other 2, and I thought it might be a rosemary flavor but then…maybe not, since everything that was supposed to be in my drink was missing. It was supposed to be garnished with rosemary, cucumber, dilly bean, sweet pepper and pearl onion – hence the “garden” part of the drink. As you can see in the first photo (the drink on the right) all I ended up with was pearl onion and olives (not listed!). Made with the jars of mix again, as a whole, it was the best of the 3, either from the gin or rosemary flavor, which made it more interesting than your usual bloody mary. I just wish it had come as described because while I hate cucumber and didn’t miss it, I looooove dilly beans. I would definitely order this one again, just not from the bar back! All the drinks were $9, and mine were served in pint glasses, but that did not seem to be standard. Maybe it was the lack of clean glasses, maybe he messed mine up, but everyone seemed to be getting different styles of glass, from pint, to other beer glasses, to smaller rocks type glasses. 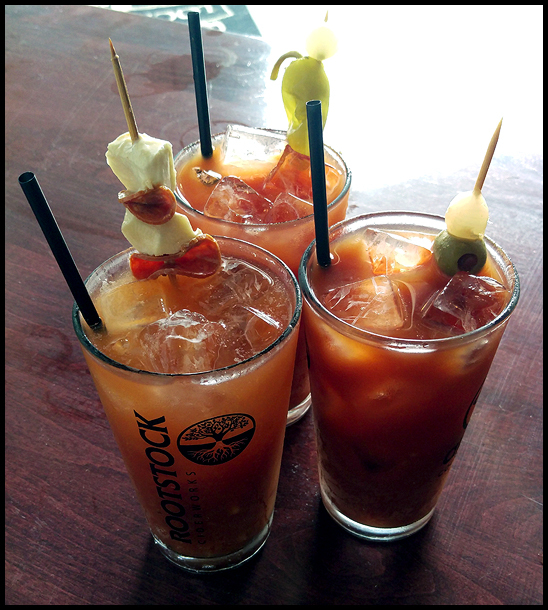 If they keep a bloody on offering at Lockhouse, I’m not sure what you’ll end up getting for your $9 in the future. While I was disappointed by the way my drinks were made, especially since we know the bar manager, and their bar tenders are usually excellent when making all their crafty drinks, in the end I was impressed with Barrel and Brine’s mix offering. I would have picked a jar up to enjoy at home if I wasn’t drowning in at least 20 unopened bottles of various mixes I bought to review here. Someday!! And the best part of all was that the $15 Lockhouse gift card I won at trivia night a few months ago turned out to be for $30!